There has been a lot of talk about how weak this year’s quarterback class is. Between Clemson’s Deshaun Watson, North Carolina’s Mitchell Trubisky, and Texas Tech’s Patrick Mahomes, analysts have been forcing themselves to find flaws and discredit the quarterbacks whenever they can. To be honest, I don’t think this quarterback class is particularly weak. Each of the aforementioned quarterbacks are better prospects to me than the 2016 number one overall pick, Jared Goff. There is one quarterback, to me, who rises above the rest, however. That quarterback is Notre Dame’s DeShone Kizer. The traits which separate Kizer from the rest of the class, above all, are his footwork, patience, comfortability, and movement while in the pocket. While sitting in the pocket, Kizer’s feet are completely settled. Often, you worry about a rookie quarterback having “happy feet” at the next level when being rushed by professional defensive linemen, but I believe Kizer will be comfortable in the pocket from day one. Kizer’s pocket presence is second-to-none in this draft class. When faced with pressure, he consistently kept his eyes downfield while making subtle pocket movements to avoid sacks. Against Michigan State here, we see Kizer’s right tackle get beat cleanly off the ball. With pressure in his face, Kizer remains calm and avoids the rusher, then delivers the ball on the money to the pylon. His footwork/comfort level in the pocket are incredibly impressive. Kizer can sense pressure so well, shifting and maneuvering around free rushers without any sign of panic. And while he is very mobile outside of the pocket as well, Kizer always keep his eyes downfield and looks for the smart throw. This right here is the type of play which makes me call Kizer QB1. Third down on the road, Kizer’s right tackle once again gets beat quickly. Kizer is forced to move to the outside and off his landmark. Still, he remains calm and delivers a 45 yard strike for a touchdown. Downfield throws are no problem for Kizer. While he struggles with accuracy at times, he has enough arm strength, velocity, and good enough decision making to sell me on his NFL ability. Once again forced to maneuver around pressure, Kizer subtly moves back before throwing the ball right on target for the game winning touchdown. Yes, the game winning touchdown. Something people love to talk about with quarterbacks are their intangibles. For example, is he a winner? A leader? How does he perform in the biggest moments? Clemson quarterback Deshaun Watson checks off all of those boxes, and while he is not talked about in the same ways, I believe Kizer does as well. Yes, it was a regular season game against Virginia, but on the road and needing to make the biggest throw of the game to keep Notre Dame’s playoff chances alive, Kizer came through. And time and time again in 2015, Kizer came through when he needed to most. Much of what I discussed so far was about Kizer’s ability to perform under pressure. But when he was given a clean pocket, DeShone Kizer shined even brighter. From a clean pocket here, Kizer stands tall and strong in the pocket, and throws an absolute dime for a completion. In Notre Dame’s offense, Kizer was often asked to make plays out of nothing, or evade unblocked rushers in the pocket. But on the occasion he was given time to operate, he came through and played exceptionally. 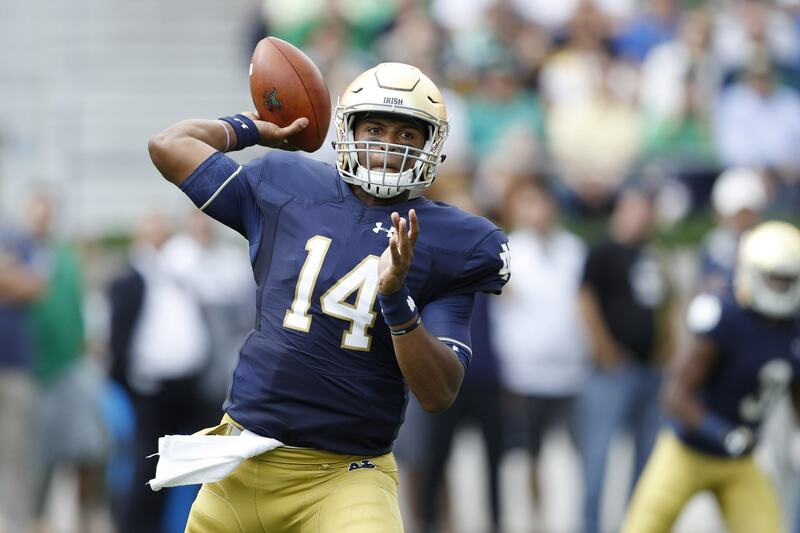 DeShone Kizer also showed adequate athleticism and decision making when running zone read and quarterback draw plays. While some discredit his ability to run and read his keys in a zone scheme due to the emphasis on “pocket quarterbacks” at the next level, players like Dak Prescott in Dallas have proved that dual-threat quarterbacks should be a top priority when building a roster. He is not a speed-demon or anything like that, but he has enough functional game speed to make it work. Of course, Kizer is not a perfect prospect. His accuracy worries me. At times, the ball will sail wildly over the heads of receivers, or he will miss throws that make you think “what the hell is he doing.” On top of this, I think he might trust his big arm too much every once in a while, which can get him into trouble. But when I watch Kizer, I see a ton of Jameis Winston in him. Does that mean he should be the number one pick like Winston? No, probably not. But to be fair, Winston shouldn’t have been the number one pick of his draft, either. To me, DeShone Kizer is the number one quarterback prospect in this draft class. While I don’t believe he is the best day-one starter out of the bunch, his ceiling is higher than any of the other four quarterbacks which are being talked about in the first round. If I were the San Francisco 49ers, I would have to think long and hard before passing on Kizer at number two. Arizona seems like a more likely landing spot, and while they may not want to spend a top 15 pick on Kizer, I would love to see him work as a backup for a year with Bruce Arians before taking over the offense in 2018.